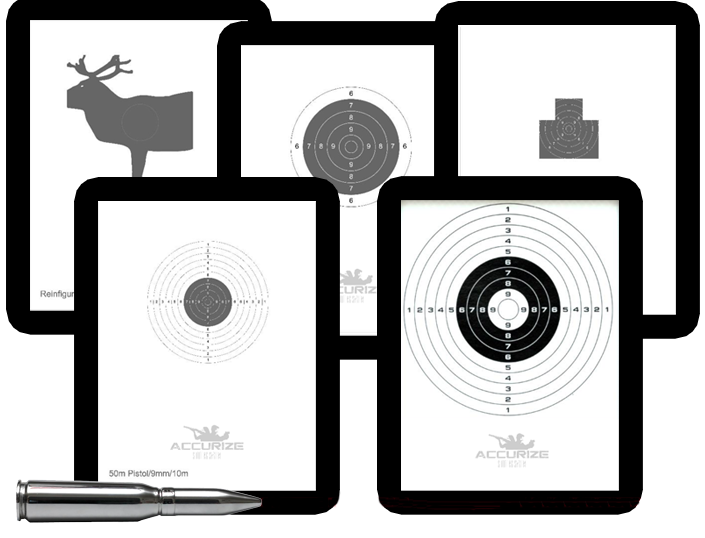 The Accurize shooting system gives you the confidence to take the perfect shot when it matters. The Accurize laser technology enables you to practice anytime, anywhere because practice makes the perfect shot. You can shoot an endless number of rounds again and again; perfecting your aim with your own weapon. Your can use the Accurize shooting system at home, your office or shed. 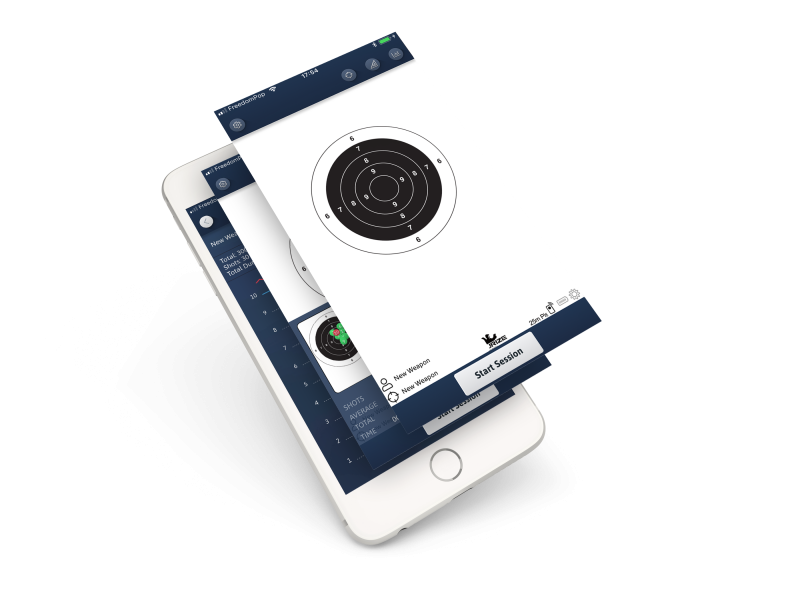 Accurize shooting system targets connect to smartphones and tablets using the Accurize app which is available on App Stores for Android™ and Apple™ for FREE. Get instant results as you fire your shots onto your smartphone or tablet. Create profiles for multiple weapons and targets and track your progress over time using the session history features including easy to understand charts. Also use the app to calibrate your weapon and sight with the App’s in-build sight adjustment feature for each weapon profile. Its a target for dry shooting, Accurize target is built on a heavy duty plastic frame to provide years of trouble free laser shooting action. With a short flash laser bullet or other laser flash you can hit the target ,and get the result of the hit directly to your tablet or phone. It works indoor and outdoor, under normal light conditions. Avoid direct sunlight on target. Integrated battery offers you hours of shooting action. Shooting on 10 m is same as shooting on real targets for pistol, rifle ,etc. No cables or computers are needed. Use your mobilphone or your tablet to monitor hits and results with Bluetooth. Use your own weapon, add your laser ammo, and in a few minutes you can enjoy a trouble free shooting. What is the size of the Accurize? Dimensions: 270 x 210 x 28mm. What is the weight of Accurize? What is the distance for shooting at the target? Accurize works between 5m and up to 20m shooting distance. Normal is 10 m distance. What targets can be used? There are different exchangeable targets which are available to use. They can be bought through your distributor/shop. What Laser should I use? What temperatures can I use Accurize? What Approvals does Accurize have? What kind of Laser Trainer Ammo should be used? If the target doesn’t register a hit within 30 minutes, it will automatically turn off. To start shooting again you need to restart the target. Turn the switch to off position than back to on position. Changing the size of the targets? You can easily change the target type by sliding the target plates into the slot on the top of the target. Choose the type depending of the shooting distance and your level of shooting. 1. Use the tripod to mount the Accurize target on. 2. Simple installation or permanent installation on a wall. Use wooden screws with a small head that fits into the slots on the backside of the target. Ensure Accurize target is on and fully charged. Go to Settings->Target->No Target Selected, hit scan and select target address that appears on screen. The app will now connect and return to settings screen once connected and target address is display under Target. On the settings screen select “Reconnect On App Start” to 1. Users are different people with their own weapons and history stored on the app. To add a user go to Settings->Users->Add User and enter a username. Each user can configure as many weapons as they like. Each weapon has it’s own configuration options for target and sight adjustment. If you wish to use the same weapon with different target types then create multiple weapons within the app to allow you to compare progress accurately. To add a weapon go to Settings->Users->[User Name]->Add Weapon and enter a name for the weapon. Your weapon will now appear on screen. Touch the weapon name to see the weapon settings. Range: Currently unused in the app but please set these correctly as a future update will utilise these settings to provide millimetre accurate results. Sight Adjustment: Use these settings to add correction for your weapons sight. On the home screen touch the person button. Select your username and weapon (these will be remembered next time you start the app). If you are connected to an Accurize target the “Start Session” button will become visible. Touch “Start Session” and when “waiting…” appears on screen start shooting. Your shots will be displayed in the target and scores displayed at the bottom of the screen. Each session is 10 shots and once all 10 have been fired the app stores the session so it can be viewed from the history screen. Changing username or weapon will abandon a session in progress. To view your previous results and compare your progress touch the chart button on the home screen when you have completed the latest shooting session. You are presented with graphs detailing your average progress over sessions. By default the last 10 sessions are displayed across all weapons. You can change the number sessions displayed and the weapon to filter the results. Touch a result from the list to get the just the results from a particular session. Touch the ellipsis button at the bottom of the screen for a complete list of all results. Most rifle scopes are delivered today with fixed Paralaxe adjustment (normally adjusted to approximately 100m shooting distance). Such scopes will be challenging to work optimally with Accurize. The challenge is the distance to the target unit, and you will easily perceive the problem if you put the weapon on a table and aim at the target assembly. Moving the eye’s position will cause the reticle to move on the target, even though the weapon is quite calm. You will simply get a visual error due to the Paralax problem. If you choose to use a regular scope, you should use the lowest possible magnification – as well as be aware that the position of the eye is as much as possible the same on each shot. 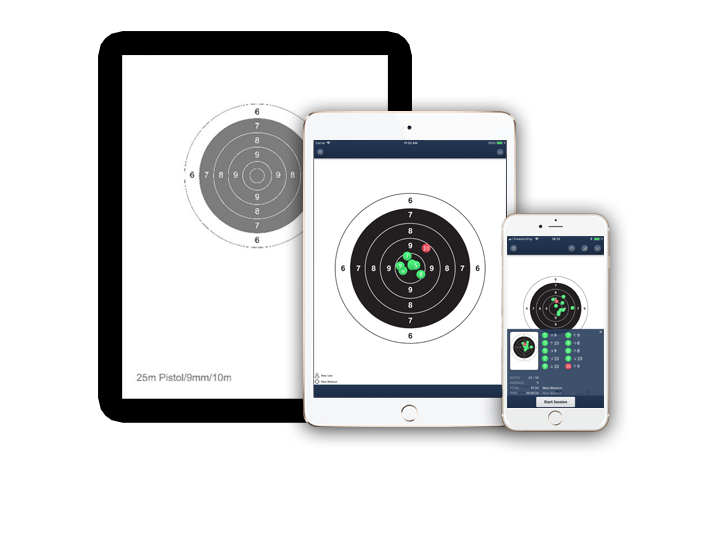 You can use Accurize as a good training tool, but precision shooting on the smallest targets- and short distance will be challenging / difficult. Accurize, however, works supremely if you use scopes with manual paralaxis adjustment, red-eye view, diopter or open sight. We collect information from you when you fill out a form on our website only. We do not collect any other information or data that identifies you personally through our website or App. Our app stores data relating to your settings, configuration and session history remotely on our servers. You cannot be personally identified by this data but you can ask us to remove it from our servers anyway by providing the UUID displayed in settings -> About screen to data@accurizetarget.com. Please be aware that by using the app after removal will reinstate the data on our servers. To remove data stored on your device by our app please uninstall the app.